Cheaper Insurance Direct Stadium in front of a 500 crowd. It was a crucial three points following the disastrous 2-0 defeat at second bottom Livingston, and restored a four point gap with Sons still having a game in hand. 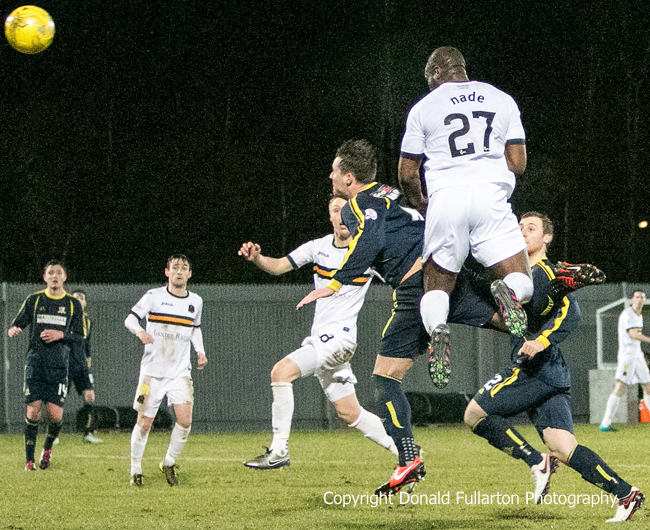 From the early stages it was the Christian Nade Show, with the Alloa defence unable to handle the big man. His first goal was a tap-in from three yards after keeper Andrew McNeil spilled the ball, but ex-Son Mitch Megginson equalised a few minutes later with the Sons defence posted missing. It took only two minutes before Nade restored the lead, leaping high to head home off the post (pictured), and 2-1 remained the score at the interval. Early in the second half he completed his hat-trick with a rasping shot across the keeper and into the net. Alloa, managed by ex-Sons assistant manager Jack Ross, never gave up, and the home defence had to work hard to prevent any further scoring — not helped by Jon Routledge being shown a straight red card by controversial ref Willie Collum after a lunging challenge. However shortly after Nade was named Sonstrust man of the match the final whistle blew. The striker left the ground a happy man and clutching the match ball.